Our dear Bill Nye (Former ‘Bill Nye the Science Guy’ host) seems to be looking for a new hairstyle ... again. It is a very serious matter. The last time he dramatically changed his haircut it cost him just over 80,000 followers on Twitter. First of all, does Bill really need a new haircut? A survey conducted by the Celebrity Post cosmetic department revealed that 89% of respondents approved the comedian's decision to get a new haircut. Does Bill Nye need a haircut? Now the question is, what hairstyle do we want for Bill? What will suit him? Complements the shape of his face? Fit his lifestyle? Cool brushed up, Slicked back undercut, Quiff, Casual side part, Short wavy side-parted, Ivy League, Rockabilly, Afro, Bowl cut? Please help with some ideas! 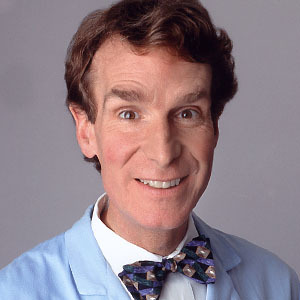 Bill Nye would definitely love to read your tips in the comments below. Disclaimer: The poll results are based on a representative sample of 1622 voters worldwide, conducted online for The Celebrity Post magazine. Results are considered accurate to within 2.2 percentage points, 19 times out of 20.